As a family enterprise, the Spanish scrap metal recycling company Toferla S.L. has been growing steadily since 1953 by buying and selling scrap and metal. For its material handling, the company utilizes two SENNEBOGEN 825. During the founding period of the company, scrap had to be collected by hand and had to be transported in a wheelbarrow. Today, the second genera- tion of the Toferla family enterprise has developed into a state-of-the-art scrap recycling operation. Two SENNEBOGEN material handlers with 13m reach and a 0.6m3 multi-shell grab, manage the loading and sorting tasks at the site of suburban Madrid. 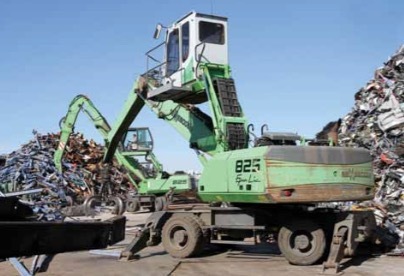 Both SENNEBOGEN 825, which were delivered by the sales and service partner Mycsa in 2005 and 2007, are used for the sorting, charging of the scrap metal shears as well as the loading of trucks. One machine can be loaded with scrap metal shears in order to dismantle larger components on-site. The height-adjustable and comfortable Maxcab places the operator at an eye level of approximately 5m, which is a quintessential criterion when it comes to comfort and safety. The SENNEBOGEN machines also set the benchmark regarding maintenance and service. The central lubrication points and an uppercarriage that is easily accessible make any service task simple and straightforward. The robust design guarantees a long service life and reliability during demanding continuous operation. The machines are driven by a powerful 129kW diesel engine. Thanks to the 2-axle mobile undercarriage with all-wheel drive, the machines are flexible enough to move on the company's grounds.